FINAL SPACING: Do not plant too many but it is a tree that I normally leave if existing on site. NATURAL HABITAT AND PREFERRED SITE: Native to Texas and Oklahoma and several other southern states northward to Canada. It seems to grow very well in most any soil, naturalizes easily but does prefer plenty of water. 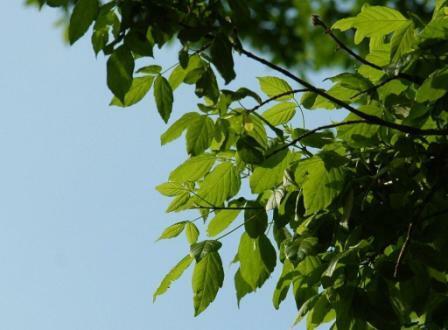 IDENTIFICATION INFORMATION: Boxelder differs from other maples by having 3 to 5 leaflets. Yellow fall color. FLOWERS AND FRUIT: Small green flowers in spring before the leaves emerge. Fruit are double samaras ripening from August through October generally in drooping clusters 6 to 8 inches long. The winged seed are reddish brown and 1/2 inch long and V-shaped. BARK: Green and smooth when young. Later turns a pale gray to brown, divides into narrow rounded ridges with short scales and shallow fissures with age. 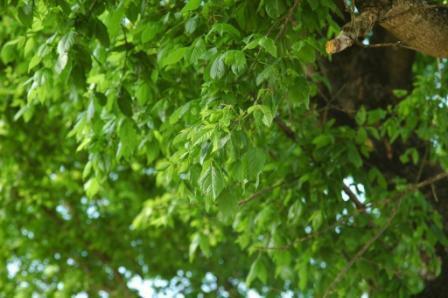 FOLIAGE: The new growth is olive green and the mature foliage is bright pea green. 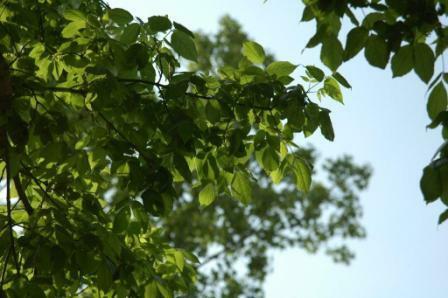 Similar look to that of poison ivy but the boxelder has opposite leaves instead of alternate leaves as does poison ivy. Leaves are 6 to 15 inches long, compound. Usually 3 to 7 leaflets. CULTURE: Boxelder is easy to grow in a wide range of soils if moisture is available. PROBLEMS: Dry conditions, insects and heart rot. Boxelder bugs are more a nuisance than a serious problem. PROPAGATION: Grows easily from seed after soaking in water. Seed should be planted in the spring and will germinate very quickly. Partial shade is helpful for the young seedlings. INSIGHT: This is the most common maple growing wild in Texas. The beautiful red and black boxelder bug loves this tree but can be an irritation although it does very little damage to the tree or any of the rest of your property.